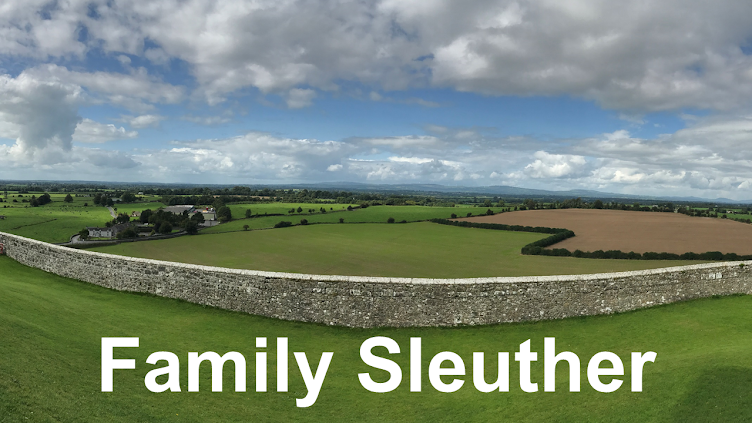 Family Sleuther: Absence Makes The Heart Grow Fonder: Now Where's That Marriage Record?! Absence Makes The Heart Grow Fonder: Now Where's That Marriage Record?! Sometimes the absence of evidence is just as important as finding a record. I remind myself of this lesson each time I search for the marriage record for my fifth great-grandparents Thomas Kirk and Sarah Bonar. In genealogy, it's one of the go-to documents. Family historians begin their research with three primary vital records: birth, marriage, and death. Yet every time I search for the Kirks' nuptials, I come up empty handed. The absence of the record makes my obsession yearning to find it grow unabated. Kirk descendants have long searched for a marriage bond, banns, license, certificate, announcement, or anything to confirm exactly when and where Thomas Kirk and Sarah Bonar were married. A family history published in 1992 concluded that they were "probably" married in 1804 in Belmont County, Ohio. A handful of online genealogies parrot this date and location without corroborating documentation. The date seems likely considering it preceded the birth of their eldest child, Vachel Kirk, who was born in about 1805 in Ohio. In 1880, 1900, and 1910, Vachel's three children each reported to census enumerators that their father's birth location was Ohio. Furthermore, an 1806 tax record assessing liability for the prior tax year positions Thomas and Sarah Kirk in Licking County, Ohio in 1805. The Bonar Genealogy, published by Dorothy Elizabeth Rine Brown, details lengthy biographical portraits of each of Sarah's nine siblings, but offers surprisingly little about her. In fact, the genealogy was unsure of her husband's first name. Brown wrote that, "The records of the late Tabitha Bonar Wilson say that Sarah 'Sallie' married a man by the name of Kirk, and that they lived at Captina, Belmont County, Ohio." Perhaps this is where earlier Kirk family histories landed on the Belmont County location. Sarah's parents, William and Jane (McCulloch) Bonar, raised their family in the northern panhandle of Virginia (now West Virginia). County boundaries shifted over the years, but by 1797 the area was split between Ohio and Brooke counties. Last week, I shared my discovery that Thomas Kirk arrived in Brooke County, Virginia (now West Virginia) in 1799 and appeared in county personal property tax lists through 1803. With confirmation that Thomas was in Sarah's neck of the woods, surely they married in the area. Known marriage locations for her siblings support this theory. Surviving marriage records and genealogies indicate that of the ten Bonar children, at least four - and maybe as many as seven - were married in Brooke County, (West) Virginia. An elder sister, Catherine, married "before 1803" and is said to have lived "up back of Wheeling" when first married, suggesting that she, too, was likely married in Virginia - bringing the total number to eight. It appears that a single brother, James Bonar, was married in Belmont County, Ohio in 1816. He is the lone outlier confirmed to have married outside Brooke County, and did so twelve years after Thomas and Sarah's likely wedding date. It seems most likely that Sarah and Thomas would marry in her home county. Wouldn't it raise eyebrows for a single woman in the early 1800s to ride off across the border into the wilds of the Ohio frontier before marrying? In the National Genealogical Society's Research in West Virginia guidebook, Barbara Vines Little writes that, "During the colonial period and the first half of the nineteenth century, Virginia law required either the posting of banns or the posting of a marriage bond in the bride's county of residence prior to marriage." If the law said the marriage had to be posted in the bride's county of residence and most of her siblings were married in their home county, then the search should definitely begin in Brooke County. 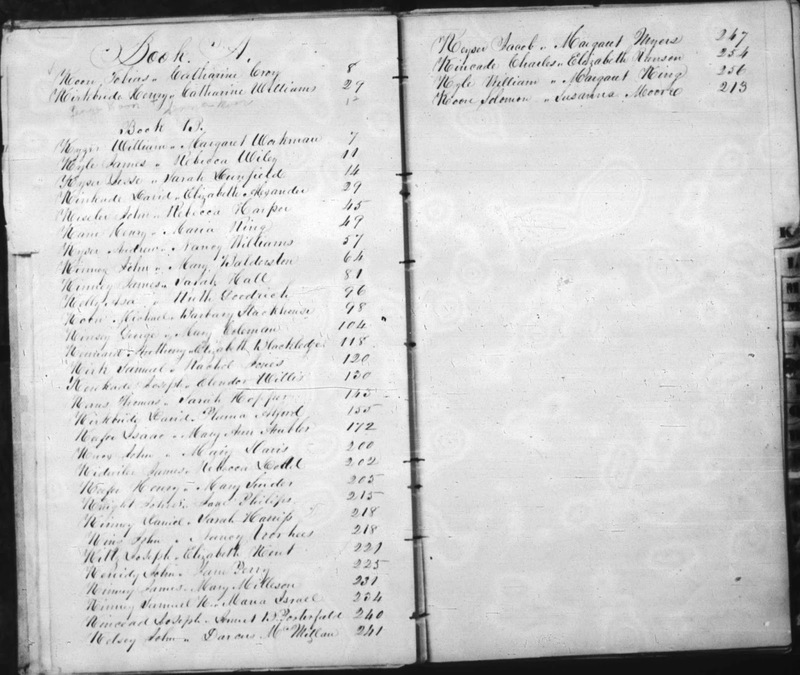 Fortunately, FamilySearch has digitized Brooke County marriage licenses dating back to 1797. 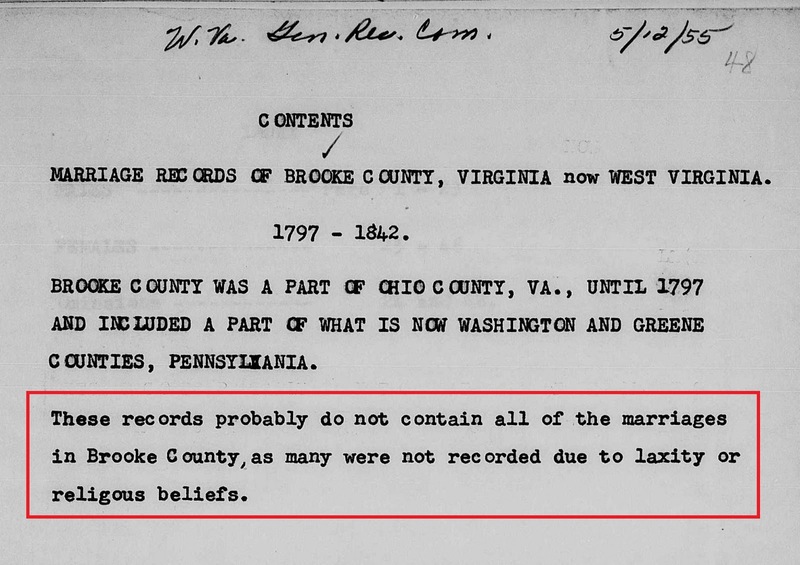 I trawled through Brooke County's records eager to find evidence of the Kirk Bonar marriage. But I kept trawling with no discovery. As I neared the end of the record set, I landed on an explanatory slide. 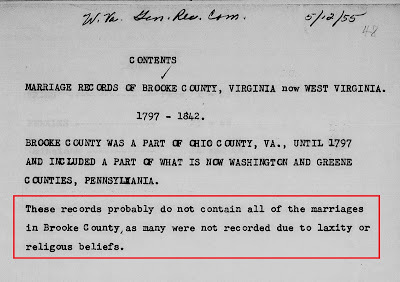 I was given an explanation why I hadn't found - and may never find - their marriage record: "These records probably do not contain all the marriages in Brooke County, as many were not recorded due to laxity or religious beliefs." In the National Genealogical Society's Research in Virginia guidebook, Eric Grundset writes that, "Although religious requirements for recording marriages have existed since the earliest days of Virginia, surviving pre-1800 documentation is uneven and incomplete. By the late eighteenth century and into the early nineteenth century the records improve, but there are many unions not found in church or government registers." In other words, despite the religious and legal requirements for recording marriages, the documentation is known to be incomplete. The marriage between Thomas Kirk and Sarah Bonar may have been lost to history due to "laxity or religious beliefs." What about the church? Maybe the marriage was recorded in a surviving church volume? It just so happens that a Brooke County chapel with a congregation founded in 1785 still exists today. Kadesh Chapel is a Methodist Church that has served parishioners for more than two centuries. Many of the Kirk descendants were Methodist. A Brooke County Methodist chapel with roots to the late 18th century sounded very promising. Does the Chapel have surviving church records that I could review? I reached out to the pastor to share my quandary and ask for his help in determining whether any records survived. He investigated the question over the course of several weeks while I waited with fingers crossed for good news. "I have run into a roadblock," came his unfortunate reply. "Our present keeper of the Church records has informed me that her records do not go back further than 1940's. The woman who had possession of Kadesh Chapel's records had a fire in her home and all was lost." There was a fire and all was lost is essentially - tragically and now comically - how many of my Thomas Kirk research endeavors end. Before falling into despair, Barbara Vines Little advises that, "Researchers should check the records of adjacent counties (or states) when the marriage cannot be found in the county of residence." Ohio County, (West) Virginia, located to the south of Brooke County. Belmont County, Ohio, located along the western border of Ohio County, (West) Virginia. Jefferson County, Ohio, located along the western border of Brooke County, (West) Virginia. Ohio County, (West) Virginia: Again, FamilySearch has digitized marriage licenses for Ohio County dating to 1790. Unfortunately, Thomas Kirk does not appear in the groom's index and no marriage record was found as I trawled through the volume (in a desperate hope that the indexer had overlooked their marriage). Belmont County, Ohio: A descendant of Thomas and Sarah Kirk personally reviewed the marriage volumes in Belmont County. She shared that she "actually went through the marriage book in St. Clairsville [county seat for Belmont County] which started in 1803. Someone else looked for me in land grants for the period from 1800 - 1805. Nothing was found." The digitized marriage index for Belmont County, Ohio, recording marriages between 1803 and 1821 does not include a Thomas Kirk. While I'm willing to investigate in the name of an exhaustive search, I remain skeptical that they married in Ohio instead of her home county in (West) Virginia. Jefferson County, Ohio: At the moment, I'm in a holding pattern researching this county. The marriage records are not freely visible online at FamilySearch. I'll need to get myself to the Family History Library or a FamilySearch center with viewing rights. Foiled By Laxity or Religious Beliefs? It seems that a marriage record for Thomas Kirk and Sarah Bonar does not survive, perhaps lost in a devastating fire. Or it may never have been recorded for posterity due to "laxity or religious beliefs." The possibilities are endless yet the search seems to have concluded that there is no surviving marriage record to be found. So now, if you'll excuse me, I'm skulking off to a dark corner to shed my tears and let it go. I'm sure this is what they call an exhausting search - or is exhaustive? ;) I admit you had me peeking at the FamilySearch catalog to see if there aren't other avenues. I have the same problem with my William A. W. Dempsey and his wife Sarah Ann Wood marrying in Fayette/Nicholas/Kanawha/Greenbrier area of West Virginia abt. 1845. She had nine siblings who married, one of them 3 times. Ten of these eleven marriages have been found. It is so frustrating! Right now I'm voting exhausting search! You know you're a genealogist when you fantasize about going back in time and devising ways to protect records for posterity (like me now). Here's hoping our sought after marriage records emerge some day. It sure sounds like you looked under every rock. Let it go, if you can. I can relate! I have 3 generations of one line I can't find marriage records for (and want for a DAR application). I'm hoping to discover a Bible record somewhere, but no luck yet. Let's hope there IS SOMETHING out there for us both! Oh that sounds frustrating for sure! Here's hoping we both discover a long forgotten family Bible or other treasure with our answers.